When your gutters don’t drain rainwater away effectively, your home is susceptible to many problems that can become expensive and inconvenient such as damage to your roof, walls, foundation, and landscaping. At Rain or Shine of Iowa, we offer gutter protection to ensure that your home is protected from water damage. Not only does a gutter cover protect your home, it also frees you from the numerous trips that you may have to make up and down a ladder to clean your gutters! 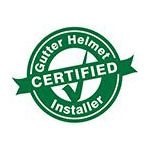 In addition to gutter protection, Rain or Shine of Iowa is among the top qualified remodelers and exterior contractors you can find anywhere in the USA. We also offer Sunesta awnings. We have a reputation for excellence that we take very seriously. Our craftsmen take great pride in their work and make sure each customer’s job is done right the first time. Whether we are installing a Gutter Helmet gutter protection system or steel siding, we make customer satisfaction our top priority. Your gutter cleaning days are over! Rain or Shine of Iowa is a certified installer and is just a phone call away from ending your gutter cleaning days. Call us at (800) 824-3772 to get a free quote or use our convenient online request form and we will get back to you ASAP. You will find that our quality products and outstanding customer service will exceed your expectations.